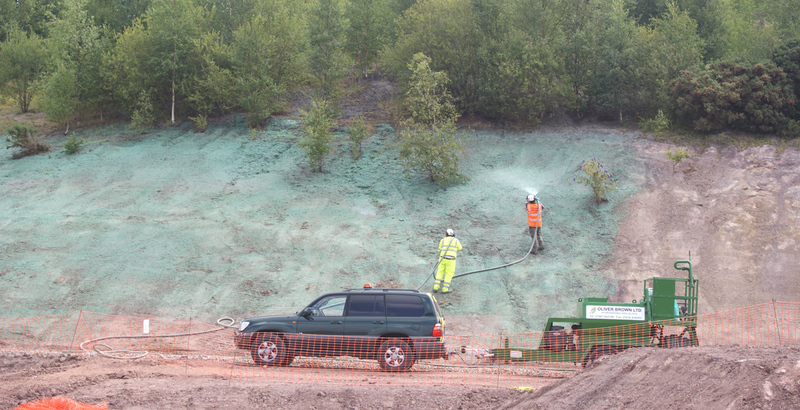 Hydroseeding is a tried and tested method of planting that has been around for longer than some people may realise. Originating back to the USA in the 1940s, Maurice Mandell from the Connecticut Highway Department discovered that by mixing seed and water together, the resulting mulch could be spread and sprayed over the steep and otherwise inaccessible slopes of the Connecticut expressways. The next step in its evolution was made by Charlie Finn. Whilst working on a project for the West Virginia Turnpike, he took Mandell’s idea and developed it further by commercially marketing the ‘Hydroseeder’ – a two-part machine with a 1000 gallon mixing tank, and an attached engine, pump, and spray platform. The first machines had an agitator used a ‘T’ shaped paddle, however the original Turf Fiber was too hard to be mixed using this paddle. This lead to modification being made to the paddle blade. However, Bowie Industries created the Rotary Gear Pump, something which worked so well they created the ‘Hydromulcher’, the same concept but with their Rotary Gear Pump, and an additional mulch shredder, to shred up any particularly hard pieces of fiber. Sales of paper fiber soon dropped due to the complications that came with the hardness of them when they were packaged, and wood fibers such as hemlock wood fiber and aspen wood fiber, which were both packaged loosely, took over. The ease of being able to tip them straight out of the packet into the hydroseeder was a great advantage. Over the years, hydroseeding has been used widely across the United States for reducing erosion control, particularly useful in a country with such vast expanses of land. A good example is The Surface Mine Reclamation Act of 1977, which was one of the largest uses of hydromulching. The 200-foot-high inclines of the Appalachian coal fields were a simple undertaking for the machines that were proficient to produce a 400 foot distance spray. Hydroseeding moved across the pond to the UK in the 1960s, and has become a flourishing industry, producing jobs and a simple and affordable seeding and erosion control solution.